The first season of Stranger Things was such a sleeper hit going in that it’s taken the impending arrival of season two for the merchandise hysteria all pop culture sensations are mandated to have. Which brings us to this, my friends: Hasbro is making a Stranger Things card game and nothing makes sense anymore. Revealed today by the toy company, the card game—which, going by the box art, I have to assume is either just called “CARD GAME,” which would be hilarious, or “Stranger Things Kellogg’s Eggo Brand Card Game,” which would be even better—is, much like Stranger Things itself, wonderfully cryptic. Gaze upon the above box, so heavily branded that I’m surprised they had the space for Millie Bobby Brown to appear on it. We know the game has 106 Eggo cards, 7 character cards, and instructions, but what the hell is an Eggo card? What do we do in this game? What does it mean to be fortified with Eleven’s vitamins!? Play as your favorite characters from the hit NETFLIX Series STRANGER THINGS with the STRANGER THINGS: EGGO CARD GAME! To begin, players choose to play as Will, Mike, Lucas, Dustin, Eleven, Hopper, or Barb and draw four EGGO cards with a variety of suspenseful outcomes. Cards can either send a player’s character to the UPSIDE DOWN, make an opponent draw 2, reverse the order of play, summon the DEMOGORGON, or cause a rift that sends everyone who was RIGHT SIDE Up to the UPSIDE DOWN, and vice versa! To win and escape the UPSIDE DOWN, get rid of all your EGGO cards before the DEMOGORGON attacks or be toast! Game includes 106 EGGO-shaped game cards and 7 character cards. So it’s Uno. Sort of? With the Upside Down? But also waffles? I’m honestly still perplexed at the Eggo-based nature of it all, other than the fact that Eleven likes Eggos. Waffles as a concept, I get. Waffles as mechanics, less so. 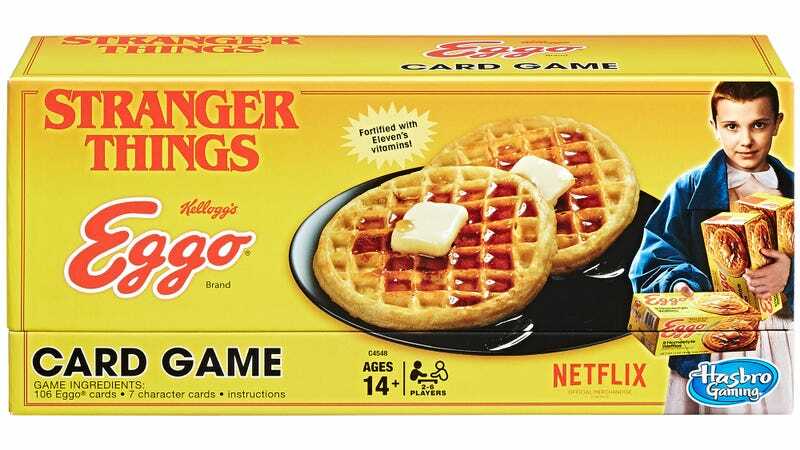 You too will be able to be confused by the Stranger Things Eggo Card Game, when it releases later this fall for $15.